Our Favorite Cross Country Skiing and Snowshoeing Trails Around June Lake! June Lake and surrounding area during the winter is truly magical. During all other seasons the trails are vibrant and alive. During the winter, covered in snow, the trails are tranquil almost as if they are resting. 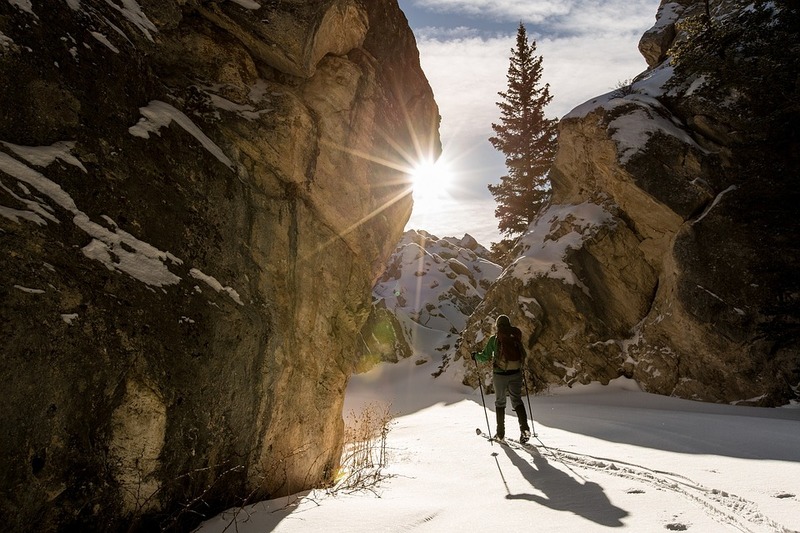 If you love hiking and exploring trails in the warm months, you will love cross country skiing or snowshoeing those same trails in the winter. Not only is it great exercise, but you get into nature in its simplest form. Never tried? 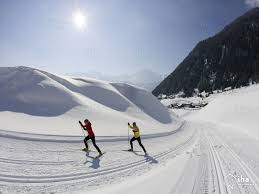 Cross country skiing and snowshoeing can be self-taught. Grab a friend and a picnic and head out on these staff picked favorite trails. A few miles past the Double Eagle Resort on Highway 158, the road is closed during winter months. Park and this gate the follow the closed road for gorgeous views of Silver Lake and Carson Peak. Cross country skiing and snow shoeing are ideal on this flat easy route. You could even hike depending on how much snow is on the road. This is a magical winter escape, where one of the busiest lakes in the summer, lies still and beautiful in the winter. Directly across from the June Mountain parking lot is North Shore Drive. Head up this road about a half mile and on the left you will spot a parking turn out. Right from this turn out the trial will head straight up the hillside. This trail offers humbling alpine views of June Mountain and other Eastern Sierra peaks. The trail is basically up a steep slope, a mile or so of rolling meadows, then a steep decent again. Snow shoes would be optimal for this route. You can ascend to the meadows and turn around, or do the full loop (about 3.5 miles) which will drop you back on North Shore Drive, about a 1\4 mile east of where the parking turnout is. This trail has also been called The Snow Ponds Trail because small ponds and lakes will start to fill the lower parts of the meadows. Reverse Peak trail requires more effort, but the views and serenity make it all worth it. Some of the easiest and quickest trails are at Obsidian Dome. From June Lake head south on highway 395 (towards Mammoth). After about six miles you will see the Obsidian Dome parking lot on your right. There are many different trails and loops so pick your route at the posted trail map. Most areas are flat and rolling, perfect for beginners or a simple snowy stroll. As the trail wines through snowy Jeffery Pines, you can catch glimpses of the Minarets to the south. This is another fun trail to wonder. At the bottom of Deadmans Pass, about 7 miles south on 395, take a right and immediately find parking. You can go as far as you desire, it is easy to stay oriented as you can see Mammoth Mountain the whole way. From June Lake head north on the 395 about 25 miles and turn left onto Virginia Lakes Rd. The road will end at a gate just before the lake. Park here and head straight until you see the lake and trail map. Continue on this trail and go as far as you wish. 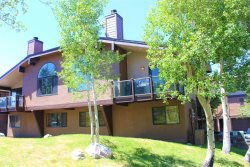 You will enjoy many frozen alpine lakes and creeks in the quiet snowy forest. From June lake head south to Mammoth Lakes. Just as you enter the town of Mammoth Lakes you will see a sign for Shady Rest Park and Recreation Area. Turn right here and follow this road until you end at the parking lot. The groomed Nordic trails are easily accessible and make for a pleasant winter stroll. Great for beginners. Equipment rentals are available in June Lake at Ernies Tackle or at Footloose sports in Mammoth Makes Safety considerations. Always check the weather before you leave. Weather can change rapidly in the Sierra, just ask the Donners! Even though the Eastern Sierra has generally stable snow conditions, one must be aware of and consider avalanche risks. Its a good idea to check out the Eastern Sierra Avalanche web pages. Bring protective clothing, even when it is pleasant and sunny as you depart for your adventure. Bring water and high energy food. Let others know where you are going and when you will return.